Day by day it’s been getting smaller. Yesterday morning the demolition of Westmorland House finally began. Built in 1966 but abandoned in 1984, Westmorland House has been a blot on the landscape of St Pauls and Stokes Croft for too long. Its derelict hulk has loomed large over this part of the city, contributing to an air of abandonment and ‘anything goes’. Over the years it has attracted urban artists, fly-posters, graffiti, drug users, explorers, the homeless and tragically six people who lost their lives falling from the building’s unprotected heights. Local residents have been trying to get the site redeveloped since the 1990s and now that day has finally come. PG Group bought the site in 2017 and yesterday their demolition contractors, Wring, sent in their biggest toys to start eating away at the concrete, steel and brick. Demolition is expected to take two months. It is anticipated that there may be pauses during the work to examine the structure and safety as the building is dismantled. Demolition works at the neighbouring Carriageworks (the frontage of which will be preserved) will also take place during the two month period. A day to be celebrated, a day to be remembered. It’s the end of an era, and hopefully the beginning of something much much better. As anyone who’s been in or around Stokes Croft in the last week will know, the scaffolding has started going up on the Carriageworks and Westmorland House. The Carriage Works frontage onto Stokes Croft is having an array of stabilising blocks lowered into place to support the structure before demolition at the rear commences. Be ready for some traffic disruption and pedestrian redirection. It has taken 35 years to get thus far. Demolition of Westmorland House was scheduled to start later this week but this has now been put back by a month or so. We’ll let you know once we have more information. Carriageworks: Wring’s are waiting for traffic and pedestrian management proposals to be approved by BCC and plan to start façade retention to carriage works w/c 20th August, the retention system should take 4-6 weeks to complete. Following the retention system being installed, the rear of the Carriageworks can be demolished, this should take 2 – 3 weeks to complete. Westmorland House: The protection scaffold to Westmoreland will start going up w/c 20th August – this retention and scaffolding system should take approx. 4-6 weeks to erect. 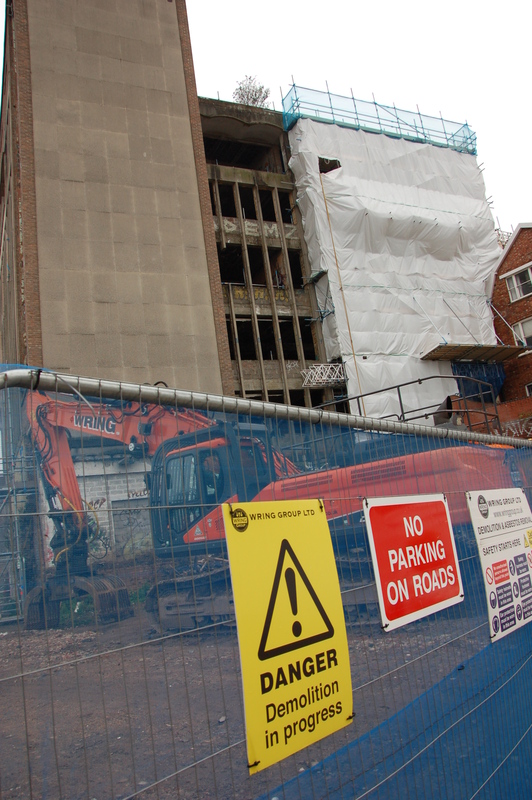 The removal of asbestos to Westmoreland House started on 6th August and should also take approx. 4 – 6 weeks to complete, so worst case scenario, barring any unforeseen issues, both will be completed by the end of September. Once the scaffold protection to Westmoreland is erected and asbestos is removed, the building can be demolished, subject to finalising the Party Wall Agreements with neighbours at 108. The demolition will use a mix of hand and machine techniques and is anticipated to take approx. 8-weeks, so should be completed by w/c 19th November. 1. There will still be two way traffic on Stokes Croft as both lanes will be retained, although both lanes will be marginally narrowed. 2. The pavement on the Carriageworks side of the road will be closed temporarily and a controlled signal crossing will be installed near the Post Office to let pedestrians cross safely. This will be in place for up to 4-6 weeks to allow the façade retention system to Carriageworks and protection to Westmoreland House to be erected. 3. Once the façade and scaffolding systems are in place, the pavement will be re-opened and a 1.5m pedestrian footpath, lined with appropriate heavy duty traffic barriers for safety, will be installed along the front of the Carriageworks/Westmorland House. The businesses on the corner of Stokes Croft/Ashley Road – Café Kino, The Arts Café and the Here Gallery – will be fully accessible during these works. Click to take a look at the detailed traffic management plans (pdf). Traffic management Ashley Road: No road closures or pavement closures on Ashley Road during the demolition works.